Some communities in the eastern mainland states have begun the huge job of cleaning up following recent floods. Others are still reinforcing levees and waiting nervously for rivers to subside. The worst seems to be over but there are the rains expected in April to think about. People have rallied to help each other as they always do – filling sandbags or forming themselves into “mud armies”. The next challenge for many will be to get insurance companies to meet commitments to policyholders. That is never a foregone conclusion as companies cry poor and, on this occasion, state and federal governments are warning that the treasury cupboard is bare. 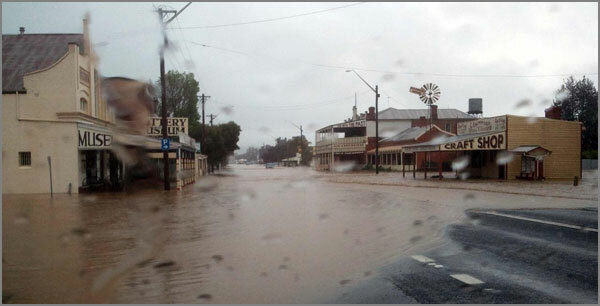 The NSW town of Holbrook was inundated by floodwaters. In best neo-liberal tradition, Australian governments are all sworn to slashing debt and producing a budget surplus. Prime Minister Gillard is making no commitments to the states or anybody else about reconstruction until floodwaters have receded to reveal the extent of the damage. The old refrain of “we will stand by communities and rebuild no matter what it takes” is no longer heard. The generosity shown to Queensland during last year’s floods has shrivelled. NSW Premier Barry O’Farrell is unhappy about the change in attitude. There are more than 40 local government disaster-declared areas in NSW that should be entitled to state and Commonwealth help. Roads and other major infrastructure need reconstruction and, unfortunately for respective incumbent state treasurers, repairs will be complicated by decades of neo-liberal penny-pinching and outright neglect. Predictions were that the NSW deficit would blow out from $185 million this year to $321 million next year. That was before the floods. Expect the axe to fall on more government services as the repair bills come in. “Our approach is to balance the books, find projects to cancel or defer, find internal savings ... and then claim the maximum amount we are entitled to from the federal, state governments and our insurers,” he said. Balance the books, cut services to the community and hope somebody else will take up the slack. But in these late capitalist times, who will that be? Insurance companies? Insurance companies are well aware of the cost of the extreme climate and climate-related events in Australia. Accounting firm KPMG reports that the sector is struggling to process over 300,000 claims arising from the bushfires, storms, floods and hailstorms that have afflicted Australian households and businesses with increasing regularity in recent years. It is estimated that claims top the $5 billion. The Commonwealth’s own National Disaster Relief and Recovery Arrangements nest egg has been depleted by $3.06 billion since 2002. Of that amount, $2.17 billion went to Queensland partly because, as KPMG points out, the state had not sought commercial insurance for government assets. The idea of “self-provision” or that everybody should self-insure for the full cost of natural disasters is out there. Enthusiasm for that idea will take a hit as premiums continue to climb as a result of the sorts of natural disasters we have already been experiencing. If private insurance is to be the major source of post-disaster relief or even the only source, it will only be those who can afford the massive premiums who will be helped to put their lives back together. Post-disaster living costs will be a further punishment on the disadvantaged. Food costs are expected to rise as agriculture recovers form crop and livestock losses. The overarching strategy for governments in capitalist countries over the past few decades has been to shed more and more of their functions and turn them over to profit-gouging transnational corporations. No aspect of public service or enterprise has been spared this treatment, not even the most vital like public health and education. The process can be fast or slow. The more politically sensitive the objective, the more likely it is that the slow, piece-by-piece approach will be taken. Political roadblocks to this agenda are sometimes cleared by a sharp turn of events; sometimes engineered politically or militarily and sometimes provided by nature. Canadian author and social activist Naomi Klein explored this aspect of neo-liberalism in her study entitled Shock Doctrine. Military coups such as in Chile in 1973 and the invasion of Iraq in 2003 cleared the way for “brave” neo-liberal experiments. So did hurricane Katrina in the US in 2005. Communities resistant to the introduction of privatised “charter schools” fell into line once the disaster left low-income parents shell-shocked and disoriented. Governments appear less and less able to carry out duties expected by communities. Every natural disaster in Australia in recent years has given rise to the legitimate demand for an inquiry into what went wrong; why government services were so lacking. The results of these inquests are telling. The underlying reason for the multiple failures is that the role of government has been paired back as a result of deliberate policy over an extended period under both Labor and Coalition governments. Recent floods will no doubt provide another cue for the neo-liberals to push their small government “medicine”. For working people it must be a spur to build the political forces that will put public assets back under public ownership and control and take urgent action commensurate with the problem of climate change.